With hardly a weeks’ time left for the special celebration of brother-sister love, i.e., RakshaBandhan, you must be noticing various stalls beside your house, school, college, office, and local market studded with various kinds of rakhis. In this rush hour of celebration, the online market is also not lagging behind and they are posing a tough competition to these local markets. The festivity of peoples mind is augmented by online gift shops with one fact and that is delivery of rakhi to UK, USA, and Australia or for that matter anywhere on earth. As the whole world has gone online in a span of a decade, huge investments has also been done in commercializing our festivals. And all for the goodness and benefit of millions of people scattered everywhere. While asking a resident of New Delhi on this growing trend of online shopping, he said, “I have already booked for some ravishing rakhi gifts for sister online who stays abroad and this is the best thing I can do as I am away from her”. Well, bringing people from all corners of the earth together is the biggest achievement of online shopping. The mesmerizing store of rakhi gifts for brothers and sisters would astound anyone who is hopping these online world. From an Archies greeting card to enticing floral bouquets, from delectable cakes to stylish personalized coffee mugs and lamp shades – the list is really long. We Indians have so many festivals lined up from beginning of the year till the end that it becomes somewhere painful to spend time without the proximity of loved ones in lone lands. 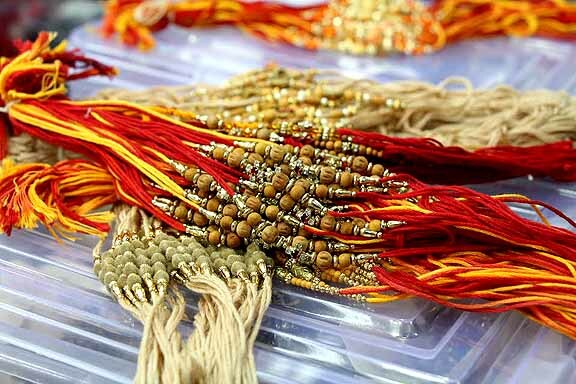 Rakhi is one of the most significant festivals of our calendar and thus online rakhi shopping has seen a tremendous growth in the past two years. One of the reasons behind this growth and development is that generally these online rakhi gift shops has wide network of services cuddled with lucrative offers like “buy a set of bhaiyabhabhirakhi and get a box of chocolates free”. Free shipping and a stipulated delivery timeline has helped these portals a lot to grow more and more. Ferns n Petals, Flipkart, Amazon, and E-Bay are some of the biggest players of this market to identify rakhi gifts online. One can find the cheapest rakhi worth Rs. 7 to expensive rakhis costing Rs. 7000 in these online rakhi stores. One of the online customers was cited saying, “There are great variety of rakhi threads like maulirakhi, peacock rakhi, kundanrakhi, gold and silver, to beaded lumbarakhis and this is why I love shopping online to select the best looking rakhi”. Thus, catering to the wide-ranging needs of millions of people and serving them right seems to be the only motto of these rakhi traders.